My wife Hu Pinghua and I warmly welcome all of you to this reception for CFAB! 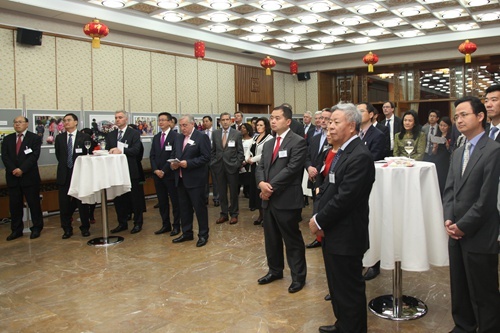 The Chinese Embassy is very pleased to co-host this reception with CFAB. I believe our co-host CFAB deserves major gratitude from all of us. For 90 years CFAB has been in active service around the world. During this time it has made tremendous contribution to the welfare of children by protecting them from the scourges of war, trafficking, abuse and violence. Many families are re-united because of your hard work. Two weeks ago, CFAB organised its signature international spring fair. The fund it raised is dedicated to child protection, family reunion and other charitable activities. The Spring Fair enjoyed full support from the diplomatic community here in London. The Chinese Embassy too played an active part in its success. l To raise greater awareness on the issue of child protection. l And to mobilise more people to join the CFAB cause. We invest so much passion in these efforts because the importance of children can never be over-stated. l They are our own flesh and blood. l They are the carrier of our hopes. l And they are the key to the future of humanity. In China, respecting the old and caring for the young is a traditional virtue. The Chinese government has given top priority to child protection . It has been improving relevant laws and methods, which means children in China now enjoy better environment, greater protection and better development prospects. l Making sure every child grows up happy and healthy. China is implementing its plan called Outline for Children's Development. This gives details of a strategy and plan that covers the period between 2011 and 2020. 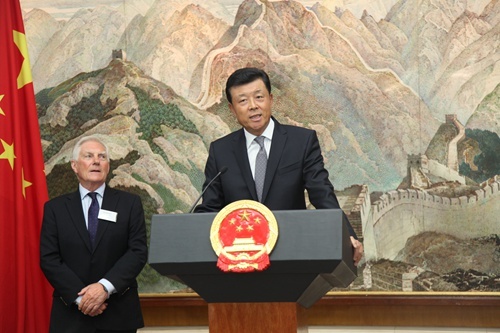 We will create better conditions for Chinese children and contribute to better child welfare around the world. In a few days on June 1st, China will have its ‘Children's Day’. This is an event which is also celebrated in many other countries. But, as I speak, there are still many children in the world suffering from violence, exploitation and abuse. Many more children are separated from their parents and families because of war and trafficking. While we love and care for our own children, we shouldn’t forget that there are still many in the world less fortunate than our own. They need our care and help too. We are in a position to help. And this must inspire us to work for a happy childhood and family for each and every child in the world.